Might as well face up to it, guys - we're never going to get pre-Natural Born Chaos Soilwork back again, and the furious, galloping likes of A Predator's Portrait are lost to time. That's not to denigrate everything that came after, of course (I still think Stabbing The Drama is a damn good album...) and 2010's The Panic Broadcast was and is excellent. Yet the departure of chief songwriter Peter Wichers last year clearly led to Strid wanting to prove the band could function effectively without him, pushing himself and the band arguably too far by making The Living Infinite into a double album. I raised an eyebrow at first hearing the news (I love Soilwork, but one hour and twenty minutes of the same song structure, as someone pointed out on the forum, does not a good record make) and that eyebrow hasn't come down upon actually hearing the final result; chiefly because they've very nearly succeeded. Nearly. Although the song structures are, admittedly, nothing that will cause any ruction in the jazzy tech-death community, there's a good effort to mix things up and be unpredictable, keeping the album sounding fresh and your ears peeled. There's more than just bells and whistles atop mediocre songwriting - on the contrary, there are a lot of excellent songs here. Opener Spectrum of Eternity starts with a classy cello and goes on to rip furiously into a melodeath stomper that initially hearkens back to A Predator's Portrait in speed and viciousness, although the epic clean-vocalled chorus is quite clearly modern Soilwork, as is the ensuing grooving breakdown. 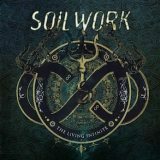 Yet you can't really fault it, from the pitch-perfect chorus to the melodic soloing; if all Soilwork was out to do on this album is prove that they can operate without Wichers, then on this evidence alone the job is done. The band keep impressing, however, never content to just throw catchy songs at you. Emotionally-charged anthems like Memories Confined and Whispers and Lights will please fans of the band's recent years, atmospherically perfect, modern and commercial without neglecting the metal side, which is always catered to wonderfully by the guitars. New man David Andersson joins Sylvain Coudret in cranking out the riffs, always worth hearing in their own merit without Strid's epic, memorable choruses. And yes, often it can seem that songs are built around these choruses, but godamnit, it works - the likes of This Momentary Bliss are perfect pop for people who like underground metal, not least because they refuse to cater to the lowest common denominator, and throw in solos and drum frills not to mention blastbeats. The lovely progressive meander thrown into the triumphant Tongue is a highlight, as is the noteworthy speed of the rampaging Let the First Wave Rise (Terror 2000 fans, hello), Vesta's introductory spaghetti-western strings, and the prog-infused thrash of Realms of the Wasted.